"You Christian?" The words were spoken in English by a small Japanese man. He had just entered a dark single prison cell somewhere in Tokyo, and was addressing the bruised and bloodied occupant. He carried a few morsels of food for the American prisoner. "Yes." Said the American flyboy, turned POW. "Me Christian." Said the little man. "Today Christian day." The American didn't understand. "What do you mean?" "Today Christian day." The man repeated. The American still didn't understand, and the man repeated the phrase a few more times. Then it struck him. Easter was April 1st. It must be Easter. Last week I had the wonderful privilege of spending the afternoon with my fabulous friend, World War Two veteran and Japanese POW, Fiske Hanley. Mr. Hanley is amazing. At 98, he just goes and goes and goes. Showing me his calendar, I couldn't help but notice it was all marked up in red! 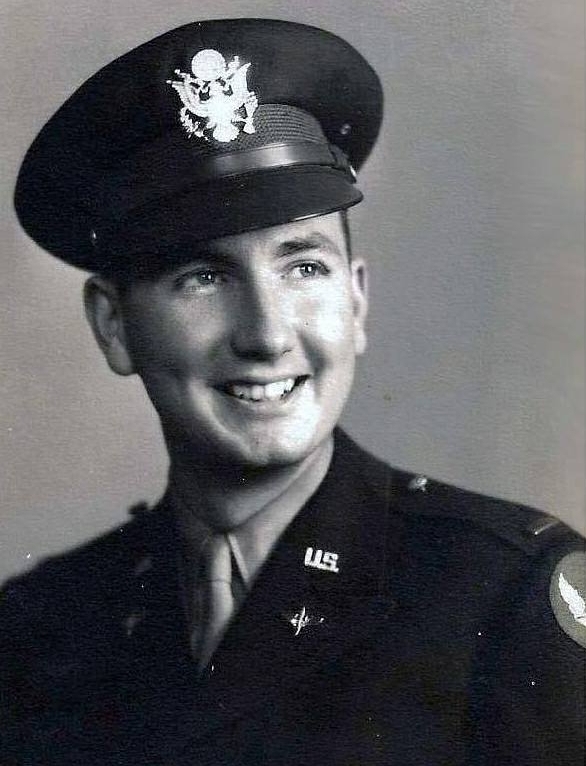 During the war, he served in the Army Air Corps flying the spiffy new B-29 bombers. A couple of years ago, the girls and I were attending an Iwo Jima reunion out in Wichita Falls, TX. The first day there we ran into Mr. Hanley. "What are you doing here?" We asked. "You aren't a Marine." "Nope." He laughed. "But I'm an honorary Marine." Then he pulled out a certificate from his jacket and said, "I bombed Iwo Jima a month before the Marines landed... most of our bombs missed the target and landed on the beaches and in the water. We killed a lotta fish. But, we did one good thing. The bombs that hit the beach created ready-made foxholes for the Marines when they landed in February. So you see, they made me an Honorary 'Marine Foxhole Builder.'" We all had a good laugh over this. Little he know at the time of the bombings on Iwo Jima, that within just 2 short months, his entire war would take a drastic change. On March 27, 1945, Fiske Hanley's B-29 was shot down over Japan. He was forced to bail out and parachute onto Japanese soil. Out of his entire 10-man crew, just one other managed to parachute to safety. It was only his 7th mission. The story that follows of his capture and subsequent torture by the Japanese as a "Special War Criminal" is one of amazing courage. Landing in a rice field, Fiske was met by a furious mob of Japanese civilians with farm tools and bamboo spears. He barely escaped with his life when the local police arrived and put the two Americans in a back of a truck. Then they headed to Tokyo for interrogation by the Japanese version of the Gestapo, the Kempeitai. As an American B-29 Bomber, Fiske was considered by the Japanese to be a civilian killer and a war criminal. From then on he would receive "Special Treatment." This included regular beatings, opening his wounds so they could not heal, starvation, and solitary confinement. By the time he was liberated in August of 1945, Fiske had dropped from a healthy 175 pounds to a mere 96. When I visited him last week, he related a remarkable story to me. A few days after his capture, Fiske was lying in a single cell. He was in pain from untreated wounds he had received from his crash. Everything he had heard about the Japanese treatment of POWs told him to expect the worst. Considering the welcoming committee that had greeted his landing, the rumors weren't far from the truth. The door opened, and a "Peon" came in carrying a stipend of food for Fiske. "I call him a peon," he told me, "Because he was the lowest of the low in Japanese society. Nobody cared about him." The little man spoke in a whisper, "You Christian?" Fiske didn't understand. "What do you mean?" He still didn't understand, and the man repeated the phrase a few more times. Then it struck him, Easter was April 1st. It must be Easter. Over the next few days of his captivity there, he found out that the little man's family had been converted by Christian missionaries a few generations back. But because of their social status (literally at the bottom of the totem pole), no one ever bothered to enforce the religion of the land on this simple Japanese family. Fiske was only held at that prison for a short time, but all the while he was there, the little Japanese man brought him what ever extra things he could sneak in to the cell. "Easter is on April 1st this year." He added, 73 years later. As he told me this story, I couldn't help wondering about the missionaries and the impact their visit had on an American POW so many year later. You never know what lives you will touch down the road... people who will not be born until you are long passed. Liberation! Fiske is Far left, behind the guy in the white shorts. 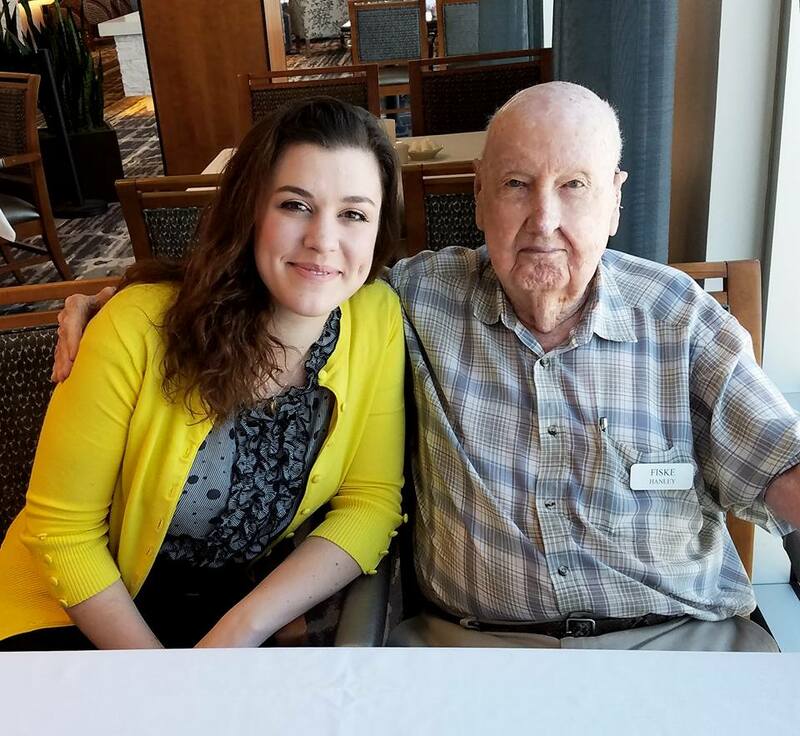 Mr. Hanley would spend 6 months as a "Special" POW," enduring unending hardships... but this brief encounter was a spark of hope amidst all the darkness. Early the morning of January 15th, ’45, there was a small patrol of us (six of us I believe), going from Cobru, Belgium to Noville. Probably two thirds of the way up, this fellow who was leading the patrol came back and said, “Gene, I just can’t do this any more.” He gave me a Thompson, I gave him my M1, went on up into Noville. We located a somewhat open garage right close to where we went up, and we stayed there the rest of the evening -or rest of the night. Between 7 and 8 the next morning I was on guard duty, and the boys were awake and I told my squad leader, “I’m gonna go scavenge up some blankets.” (because we had no heavy clothing). I went out and went up the street in Noville, toward -well it turned out to be toward the church- and this first house I went in, up and down and nothing. Absolutely nothing. No sheets, not even a piece of paper. So I came back down, and as you can see, these sidewalks are very narrow. Just as I turned to go in to the second house I heard this big noise. Loud noise. Well, I hit the ground like a sack of potatoes, and I don’t remember a lot of pain. It was just I knew I was shot bad, but I don’t remember a lot of pain. I’d been hit in the chest and hit the ground bleeding and sucking blood. I did a little praying, and I called for the medics. The medics didn’t come. I did that three times and I finally decided, “I’d better get outta here.” I didn’t see the guy that shot me; I haven’t found anybody that did. Any rate, I managed somehow to get this Thompson over this shoulder, held this arm like this, and walked back to where the boys were (which was probably a hundred and... maybe 200, 300 feet maybe). They gave me a shot of morphine, and my squad leader and I started back to the aid station -which was about a mile. I got within, probably a 100 yards or so, I ran out of steam and he carried me the rest of the way and put me on the jeep. And that’s the last I knew till 10:30 that night in a field hospital in Luxembourg, Belgium... It broke my collar bone, and of course screwed up these radial nerves. Of course broke this arm pretty bad. And I’ve got about this much shorter... Perhaps a half-inch shorter left arm than the right. But radial, radial nerve damage was, was really the most serious part of it." Mr. Gilbreath was shipped to England where he spent the next several weeks recovering, than he was sent home for more treatment. His war was over. A couple of years ago, we had the privileged and honor to visit the exact location where he had been wounded and hear from him just how it happened. We could almost see everything as it happened, so many years ago. 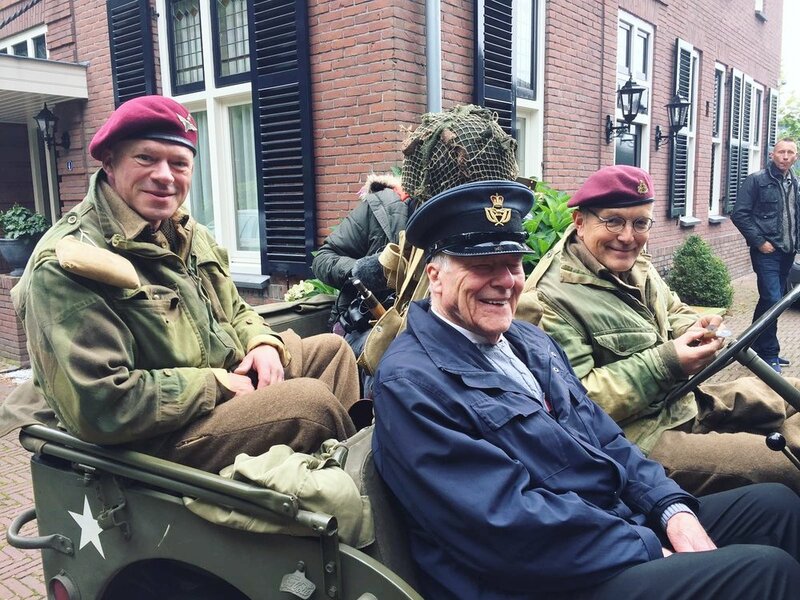 Though his stint in the Airborne was shorter than he would have liked, if you ask to him today he will tell you that being in the 101st Airborne was one of the most defining things in his life. Thank you Mr. Gilbreath. 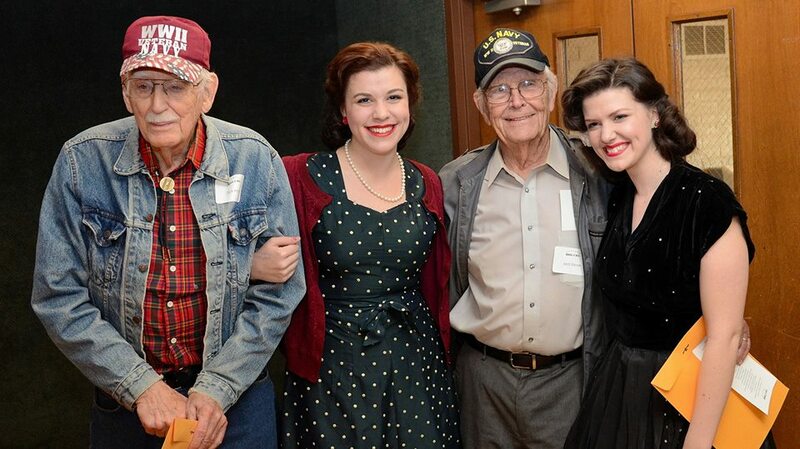 Last week we headed up to Fort Worth for our monthly WWII Veterans' Luncheon. As I'm sure we've probably mentioned many times before, this luncheon is the highlight of each month for us. 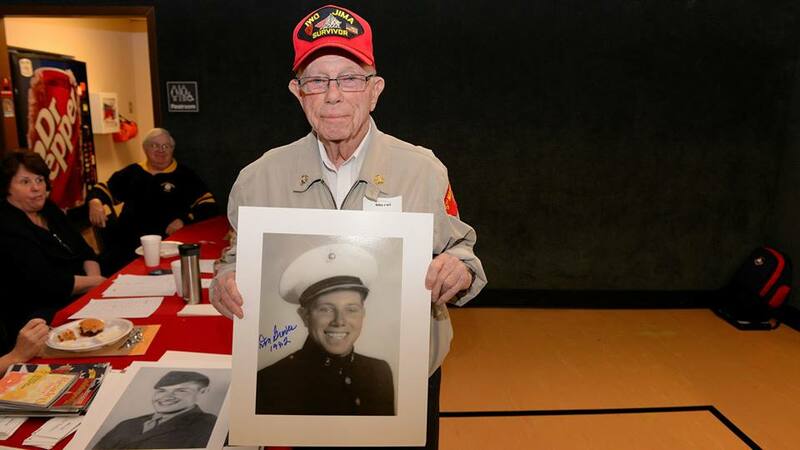 About 2 years ago, a dear Iwo Jima veteran friend in the Dallas/Fort Worth area connected us with Kevin Boldt, a retired Army Medic and Care Home operator who would get together each month with about 60+ WWII veterans for a special luncheon to talk about their war experiences. Mr. Boldt told us that initially the luncheon was just a handful of folks who would meet at their local Golden Corral. However as more and more veterans heard about it, the luncheon grew until they had to happily move to a much larger facility. By the time we made our first visit, 60+ WWII veterans were on the roster, plus nearly 100 family members and friends. Richard Stanley, US Army, escorted by the local Civil Air Patrol. In the last two years, it has grown enormously and now includes numerous veterans of Korea, Vietnam, the Gulf War, Iraq, and Afghanistan. In fact it has grown so much that in the last few months, after lots of work on the part of Mr. Boldt and his incredible staff, the monthly WWII Veterans Luncheon became officially incorporated and titled, "Roll Call Fort Worth." Their new mission statement: "To share through education, publication, and fraternity, constructive remembrance of Honorable actions taken by American Military veterans and service members." At each luncheon, Mr. Boldt takes the mic around introducing new veterans, remarking on birthdays and anniversaries (we have several well into 70+ years of wedded happiness), and then concluding with a special veteran spotlight where he interviews one of the veterans about the service for all to hear. 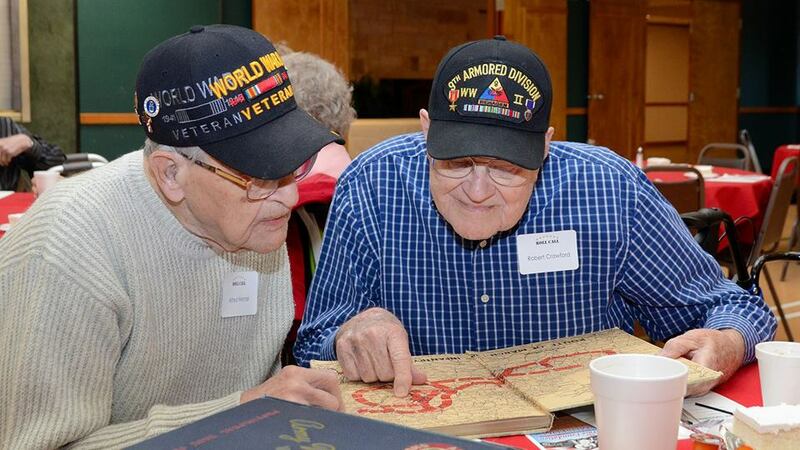 This last month, the veteran highlighted was with the 7th Armored Division during the Battle of the Bulge. 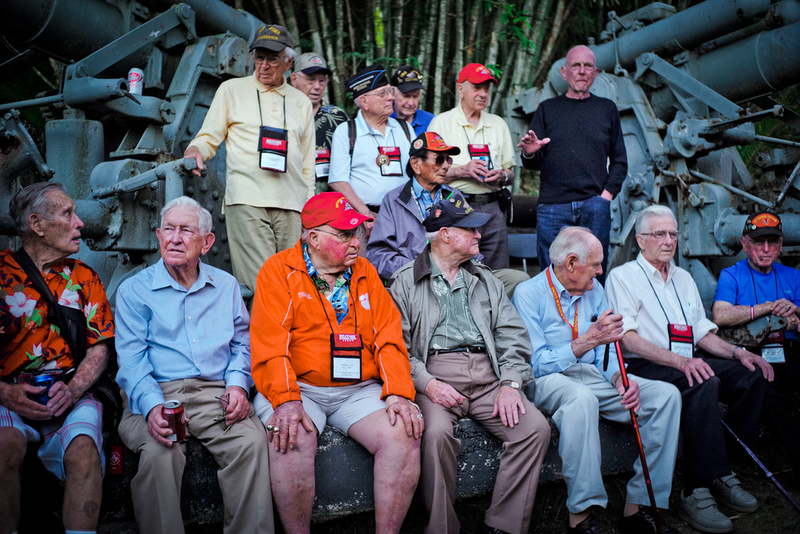 On anniversaries, such as Pearl Harbor Day or Victory in Europe Day, the veterans share their thoughts on where they were and what was going on. It is really a step back in time to listen to them. So getting back to last weekend. Honestly, each luncheon tops the last. And last week was no exception. Once again it was standing room only for a house packed with men (and women!) who have bravely served our country over the last 75 years. B-17 pilots, Navy gunners, concentration camp liberators, paratroopers, Iwo Jima Marines, former German and Japanese POWs, and pretty much anything or position you can think of. 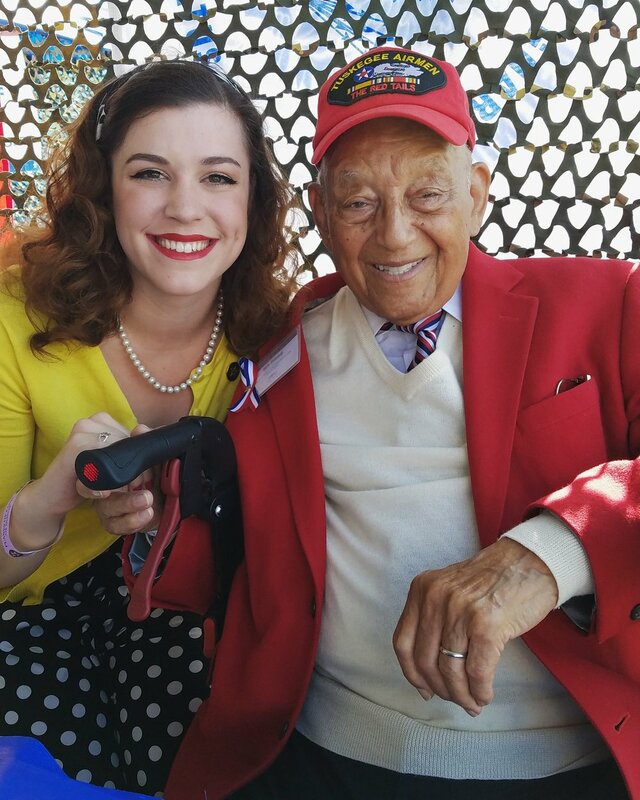 The youngest WWII vet is about 88 and the oldest 101, with a whole bunch of 90's, 92's, 95's, 97's, and a couple of 99's in between. Pretty, pretty fabulous. I can't even begin to imagine how many years they are all added together. There are so many- yet so few- words to describe how meaningful and beautiful these afternoons are. 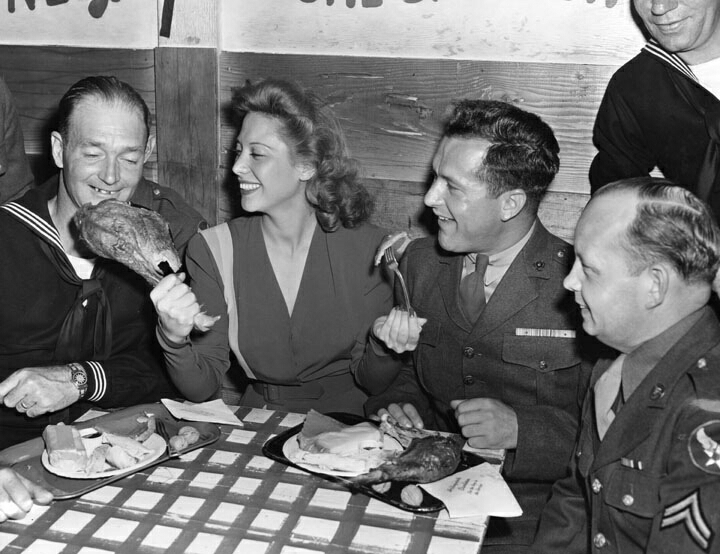 In a way it feels a little like the USO Canteen days of WWII. Greeting the veterans as they arrive (en masse), chatting with them about their families, where they grew up, their military service, and keeping them stocked up on coffee and tea. They are not the strapping 19-year old soldiers they were when they first visited the USO Canteens in 1944, now they have a few more wrinkles, maybe a walker or cane (and that is a maybe), and perhaps can't cut quite the rug on the dance floor as they did 70+ years ago; but they still have that same twinkle in their eyes, rib-tickling humor, and infectiously genuine delight in life. It is always an honor to be a part of such a wonderful family as our Fort Worth friends. "Eat your heart out girls. We've been married 70 years." The absolutely darling Mrs. Johnson told us this right after laughingly declaring that the cute (and very tall) Texan was HER man and for us to steer clear of him. Oh they'd had a lot of fun over the years she said. "We were hippies" after a fashion. For their Honeymoon they took bicycles and went all over Norway, camping out and occasionally staying in local hostels. Before she met Bill, she'd been warned that Marines were a dangerous lot and she shouldn't date them -a rumor probably started by some Navy fellow-, but now she was curious. Finally she got the opportunity to date a very confident (aren't they all though!) Marine. One evening he took it upon himself to teach her some of the drill steps. When he ordered her to march towards him, but neglected the order to halt (hoping she would walk right into a kiss), she saw through his games and decided that yes indeed Marines were a wily lot, but she certainly liked them. Soon after she found herself the tall Texas Marine of her dreams, Bill Johnson, and proposed to him. He accepted and they were married. Miss Personality pretty much describes her to a T. And Gary Cooper 2.0 describes Bill. Together they make the cutest dream couple. And we will all be happy if we can be just half as amazing at 90 as Mrs. Johnson is. The last few months have hurried along faster than any of us expected, and it is quite hard to believe we are halfway through the month of June. Some of us are still scratching our heads and wondering where March and April went. All that to say, that hopefully in the next few weeks, we can catch up a bit on some of the doings of "Operation Meatball." Two weekends ago, through a great blessing and provision, we found ourselves in Reading, Pennsylvania, after a rather interesting trek up North (the rains of Texas seemed to be following us the whole way). 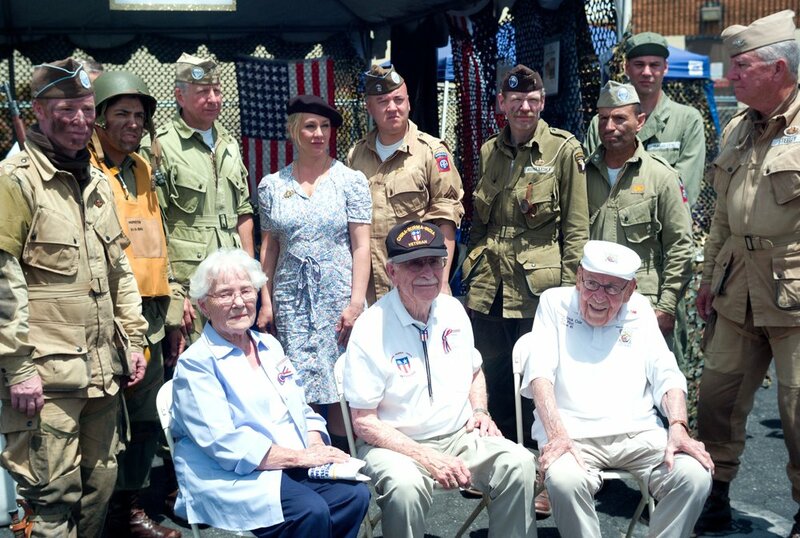 Each year the Mid Atlantic Air Museum (MAAM) holds a grand Airshow over the D-Day anniversary. It's called the Reading WWII Weekend. 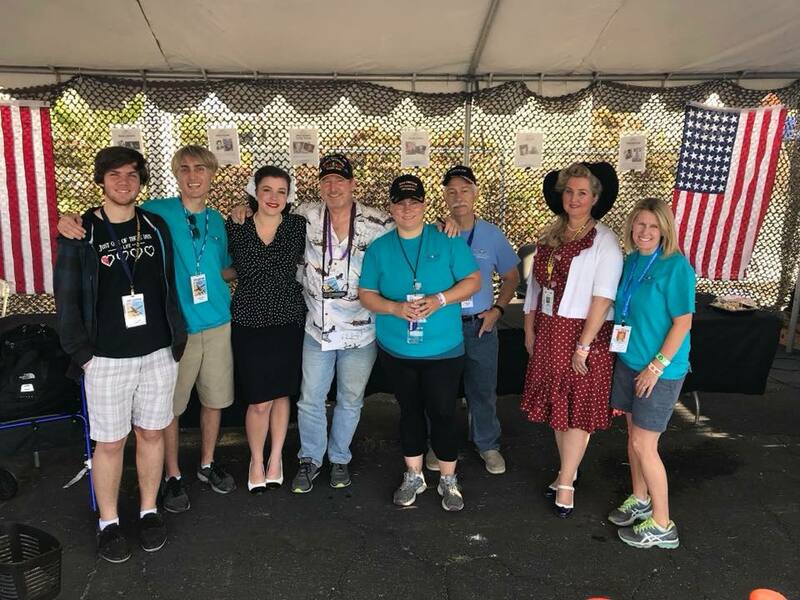 We've been hearing about this great event for several years now, but the timing had just never worked out; however this year it did, and it was fabulous. For three days, the grounds surrounding the MAAM are transformed into the various theatres of operation during the war. Walking around you can go from fighting forces on the European front to the Marines of the Pacific. Go a little further and you run into the Brits and Russians, while just a brief turn in the road takes you to home-front America with Singers and Entertainers (like Abbot and Costello) in a little cafe, a walk-in home from the 1940s, Red Cross workers, a movie theatre, Candy-shop and more. 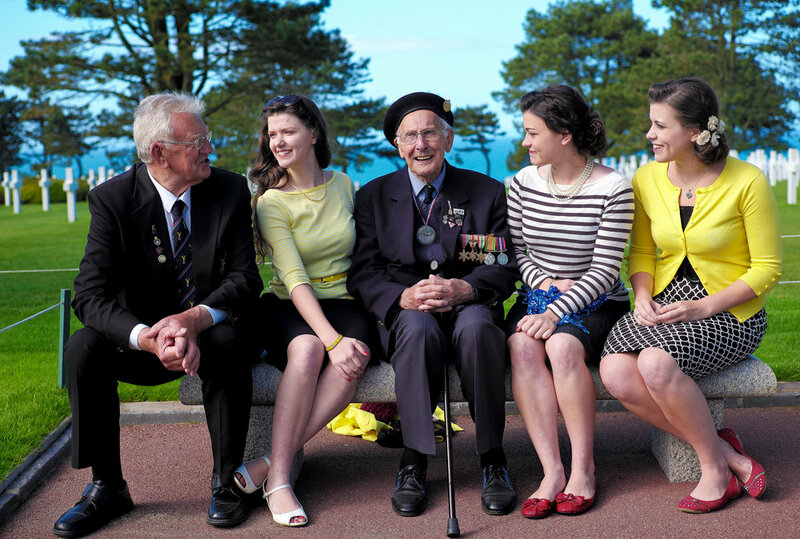 One of the main highlights of the event is the large assortment of guest speakers and veterans of WWII you can come to hear. 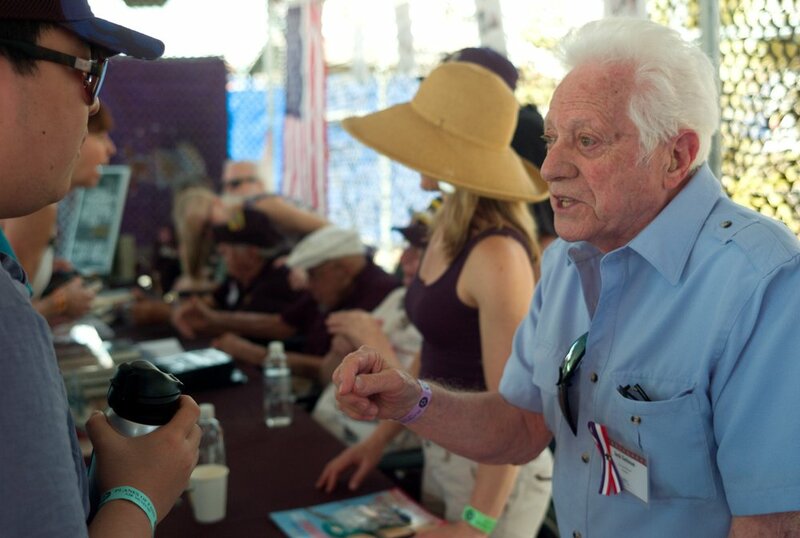 A Marine Corps veteran talk of his experiences on Iwo Jima, or a 1st Division man about the Beaches of Omaha on D-Day. An Auschwitz survivor, even a former Hitler Youth member. Their stories are remarkable. Because it would take a great while to catalogue the whole lovely weekend, below are some of the highlights. 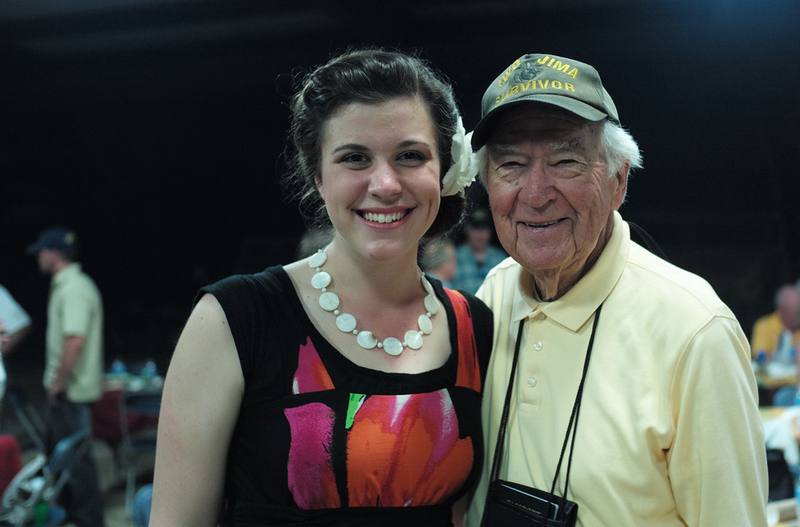 One of the high points of the Reading WWII Weekend was meeting Mr. Sal Castro and his delightful wife (not pictured). Mr. Castro was a combat veteran of the 32nd Infantry Division and recipient of the Congressional Gold Medal for his service in the Civil Air Patrol during the war. Mr. Sebastian de something-italian-and-very-hard-to-pronounce, an adorable little Italian who didn't walk - he danced everywhere - declared to me, "I'm 93, I still have my hair, and I still have my teeth!" One of the nicest veterans we met was Mr. K., a sailor from the USS John W. Weeks. During one of the musical programs at the event, we were just getting up to escape the rain when he motioned for us to come over. "I have a question," he said. 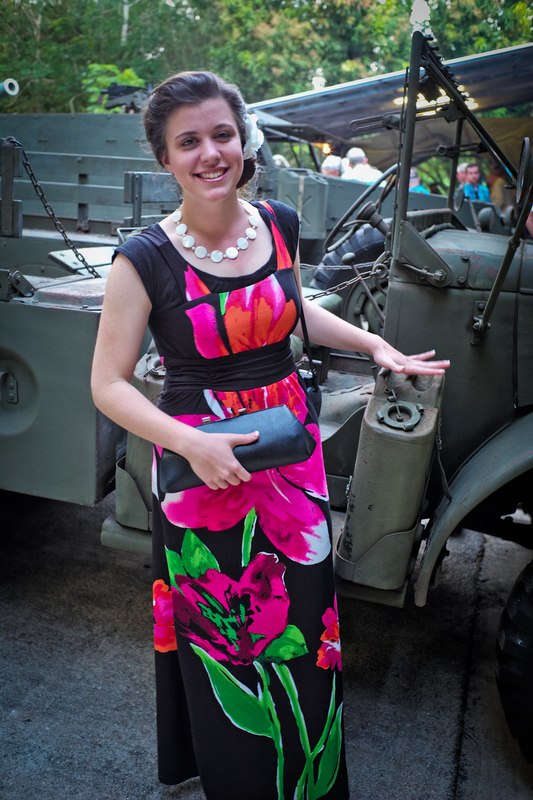 "You look like you are dressed the way they were in the 1940s." "Yes sir!" We told him. "You see," Mr. K. said, "I am a WWII veteran, and I grew up in the 30s and 40s and that is how all the girls dressed then." He then went on to tell us about the clothes and the music of the time, tearing up at the latter. When we asked why the music made him cry, he told us that it was the memories attached to them. Some hard, many wonderful. The song, "White Cliffs of Dover," was especially close to him and made him tear up because it reminded him of his late wife, a lovely Irish war-bride whose heart he had captured and brought home. "We weren't in love at first," he said about his wife. "We just clicked and got along real well. It was after we were married that the romance came." He told us that he saw her "27 times" during his time in the Navy, and decided to marry her when he was sailing around New Guinea. She agreed and they were happily married nearly 65 years. We eventually had to say goodbye to our lovely new friend, and as we were going he said, "I'm so glad you came over. Because I was sure you girls were dressed like they did (and like my wife did) in 1945, but I had to ask." To see the delight in his face at recalling these old memories really made our day complete, and added a fresh reminder of why we love what we do. Faith chatting with our a dear friend John McCaskill. 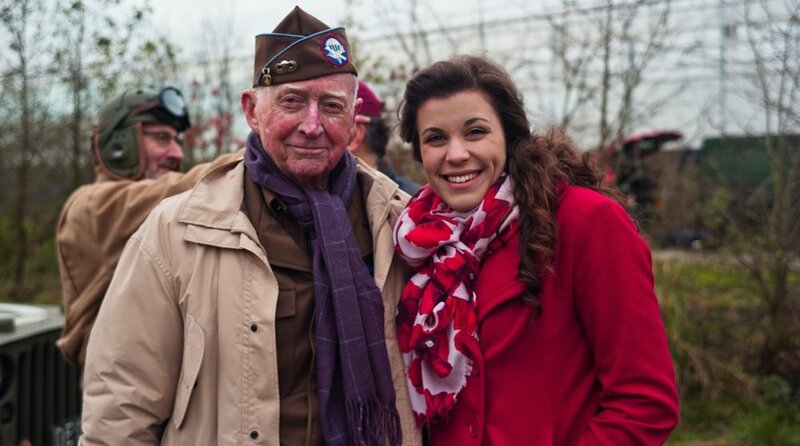 Mr. McCaskill is entirely to blame for getting us hooked on Honor Flight, and we couldn't thank him enough for it. The whole weekend in Reading was just as lovely as it could be. Though our first, there will be hopefully many more times to come.